Norwegian Airlines is Europe’s third largest low-cost carrier and currently offers flights to 76 destinations. Norwegian Airlines is also the UK’s only direct low-cost airline offering flights to the U.S on the Dreamliner which I have reviewed. Short-haul routes use the B737-800 which I have reviewed below. In this trip report I review Norwegian Airlines in Economy as it does not offer a Business Class on their B737-800 (unlike their Dreamliner). You can book economy seats on their website and you need to pay £7-£25 to reserve a seat or you will automatically be assigned one for free. Extra legroom seats come at no extra charge. All passengers can take one carry-on bag free of charge, as well as a small personal item. Your ticket type will determine how much your luggage can weigh: 10kg in total for Low Fare, Lowfare+ and Premium; 15kg for Flex and Premium Flex. Lowfare+ tickets include 1 item of checked luggage seat reservation. Flex tickets include seat reservation, checked baggage and fast-track. Low Fare and Lowfare+ tickets can add fast-track for £9 up to 30 minutes before departure. I flew Norwegian on their B737-800 on a flight Nice to Gatwick soon after they launched. I usually fly British Airways Club Europe on Avios, but I had decided to extend my trip and Norwegian came in super cheap. Unfortunately they no longer fly on this route. On the morning of my flight using the Norwegian iPhone app, I saved my mobile boarding pass to Apple Wallet. Boarding was quick and efficient although the overhead bins were pretty full. The cabin was immaculate, being a new plane, with flat screen video units that showed the safety briefing and then Mickey Mouse cartoons and travel programs during the flight. The Norwegian B737-800 had 31 rows, with 14 and 15 by the emergency exits in the middle, see the Norwegian B737 seat map. Seats were arranged 3-3 (A-B-C, D-E-F), and are upholstered in black leather with red headrest covers and generous seat-back/bulkhead pockets. The tray tables were a decent size for working on a laptop. 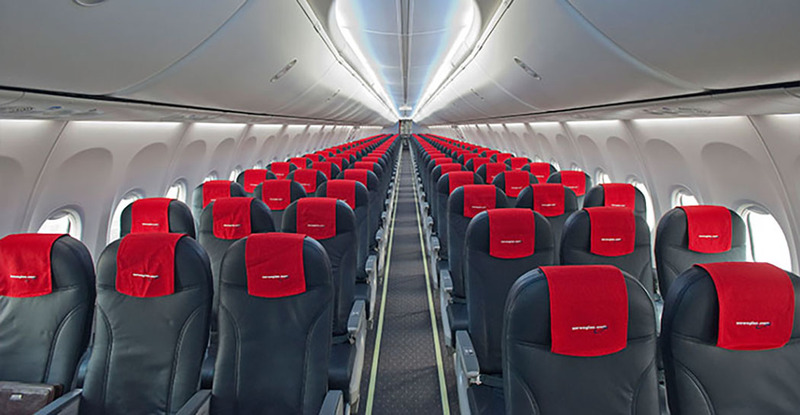 Which Seat Is Best On the Norwegian B737? The seats nearer the front are best for speedy boarding and disembarkation. Rows one and two offer the most legroom but you will have to store all luggage in overhead lockers for take-off and landing. Norwegian offers free wifi with no password and the service is good. Our flight was pretty rocky, with very high winds in Gatwick. I think we were the last flight they let in. The plane did jump about but the pilots miraculously got us down safely and seemed very competent. Overall I would definitely fly Norwegian within Europe again. Their planes are new compared to Britsh Airways and their prices are excellent.